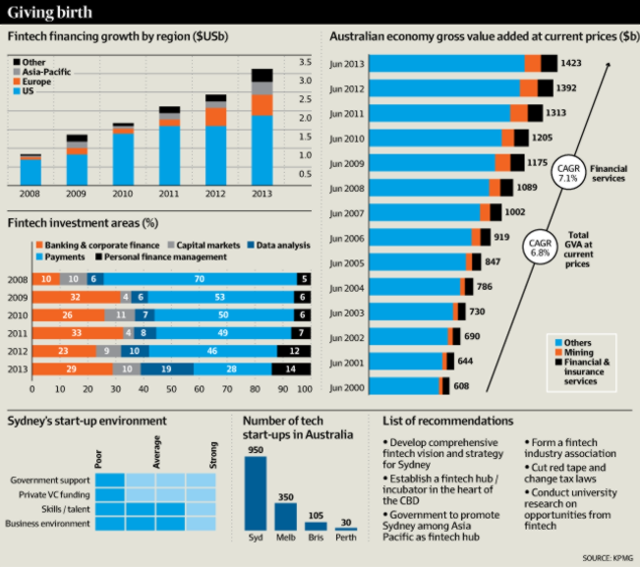 Australia has historically been a good pocket of fintech innovation. A new report crystallizes the opportunity to take action....and to take queues from what the UK government have done to drive collaborative development of the fintech sector in London. The federal government must do more to foster the thriving financial technology industry in Sydney, which could become a big contributor to the national economy but risks withering on the vine as tech savvy workers are lured abroad by tax breaks. A report by KPMG and think tank the Committee for Sydney, which will be launched by NSW Deputy Premier Andrew Stoner on Tuesday, calls for governments to create a comprehensive vision for fintech while promoting Sydney’s capability in the sector throughout Asia-Pacific. A not-for-profit physical hub should be established in the CBD to allow start-ups, venture capitalists, researchers and established financial services firms to collaborate, the report says. It also calls for an independent fintech industry association to be set up, and for universities to step up research on opportunities for Sydney, given its financial services proficiency and deep workforce of information, communications and technology (ICT) professionals, along with its other creative and professional service industries.